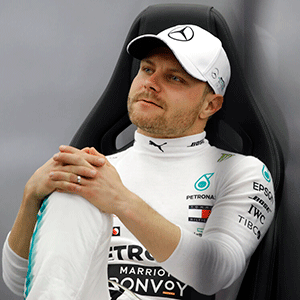 Shanghai - Valtteri Bottas spun his Mercedes before upstaging team-mate Lewis Hamilton and their Ferrari rivals to go fastest in practice on Friday for the Chinese Grand Prix. The Finn tops the early drivers' standings and he showed why with a lap of 1:33.330, pipping Ferrari's Sebastian Vettel by just 0.027 ahead of Sunday's 1 000th race. Third-fastest was Red Bull's Max Verstappen with Hamilton, the reigning world champion, a significant 0.707 off the pace.